Korg is now shipping the latest model in its MR Series of DSD digital recorders – the MR-2 High Resolution Mobile Recorder. With many new and requested features, the MR-2 is a true workhorse. As with all of Korg’s MR Series recorders, the MR-2 records in the ultra-high fidelity DSD format, using a 2.8 MHz sampling rate, which captures every sonic detail while preserving the ambience of the original recording location. Using the included AudioGate software, this original datastream recording can be re-purposed into nearly any audio format with minimal fidelity loss. 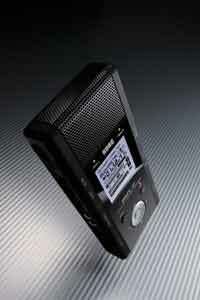 For job-specific recording, the MR-2 can also record in any of the popular multi-bit formats, from MP2 and MP3 up to 24-bit/192 kHz files. The MR-2 features a built-in, professional-grade, electret stereo condenser microphone. The mic housing can be rotated toward the front, top or rear of the MR-2 in eight 30-degree steps, offering the freedom to point the mic directly at the target recording source. Two screw mounts allow the MR-2 to be attached to a general-purpose camera tripod for flexible mic-ing and positioning. An additional jack enables connection to a favorite external mic. An on-board analog limiter, low-cut filter and bass EQ are available to enhance the quality of recordings made on the go. This high-performance analog circuitry remains under accurate digital control, just as in the sophisticated consoles used in professional recording studios. The MR-2 includes 40 easily-selectable Recording Setups. Each contains its own settings for mic sensitivity, input level, analog limiter, low-cut-filter and bass EQ. These setups offer optimized settings for a range of recording tasks and environments, such as ensemble performances, solo vocal or piano performance, as well as settings suitable for field recording or documenting meetings. Ten custom user settings can be memorized. Data recorded on the MR-2 is stored directly to an SD/SDHC card. There is no motor – as would be required for a hard drive – which eliminates any chance of unwanted drive noise being captured and recorded. Over 11 hours of top quality DSD recording is possible using a 32GB card. The USB 2.0 connector (Mini-B connector) allows the recorded data to be transferred to a computer at a high rate of speed. Portable and easy to operate, the MR-2 features a highly visible 128 x 128 pixel liquid crystal display. The backlight provides great visibility, even in dim locations. Dedicated buttons and switches allow quick adjustments to the input level, Hold on/off, etc. When capturing a musical performance, a convenient multi-mode chromatic tuner is built in. Both battery (AA x 2) and USB power sources allow the MR-2 to be used almost anywhere. The MR-2 is bundled with Korg’s AudioGate audio format conversion software. In addition to converting files from DSD to multi-bit PCM (or vice versa), this software is an ideal way to edit the recorded material or to manage archival masters. Two different types of dithering are offered, including Korg’s “Noise Shaped Dither (KORG AQUA),” which matches the perceptual response of human hearing. The Korg MR-2 is now available with a U.S. MSRP of $899.